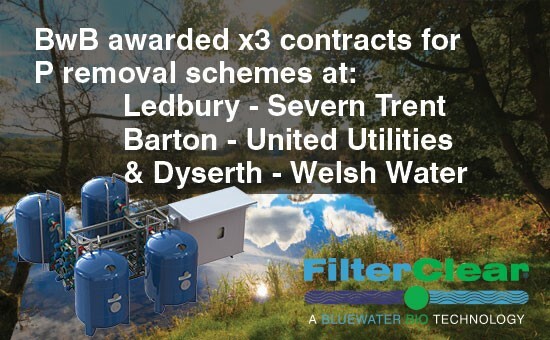 Bluewater Bio Limited, a leading provider of treatment solutions to the water industry, is pleased to announce that its high rate multi-media filtration technology, FilterClear, has been selected for three further plants by three different Water Companies in order to achieve compliance with tighter phosphorus consents. BwB will provide in each case a fully automated Tertiary Solids Removal (TSR) plant. 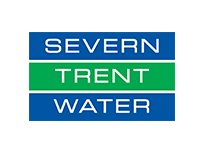 The Company will work with Severn Trent Water’s (“Severn Trent”) capital delivery framework partner, Costain/Stantec (CiM6), in providing a TSR plant at Ledbury WwTW, Herefordshire. 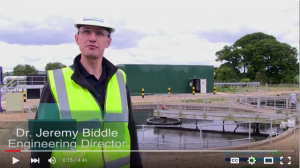 This marks the Company’s fifth contract with Severn Trent for phosphorus removal. For United Utilities (“UU”) and Dwr Cymru Welsh Water (“Welsh Water”) –– BwB will deliver TSR plants at Barton WwTW and Dyserth WwTW, respectively. 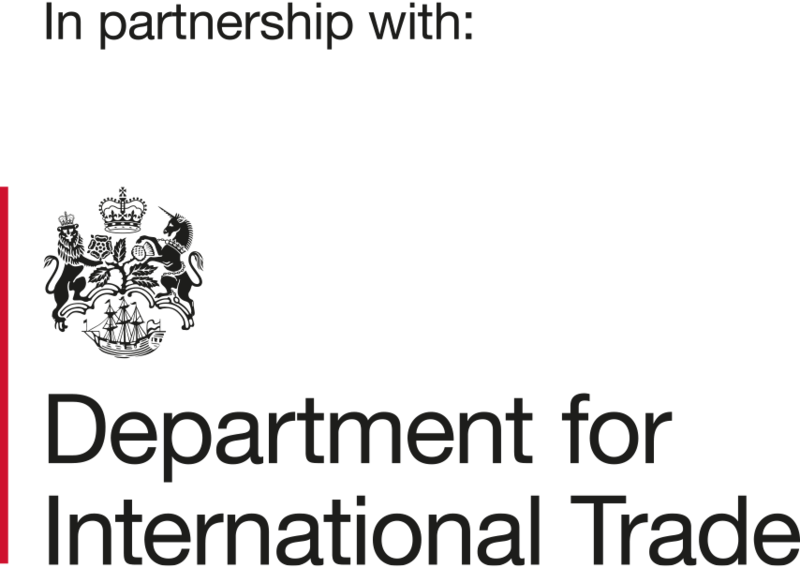 Mott MacDonald Bentley (“MMB”) are in both cases the nominated Tier 1 delivery partner. Ledbury WwTW is a medium sized activated sludge works, consisting of two crude oxidation ditches and operating in enhanced biological P removal (EBPR) mode, serving the market town of Ledbury, Herefordshire. The site currently has a population equivalent of 14,500 which is expected to increase to 20,000 at a 2028 design horizon. The works also receives a significant industrial load. The Company will provide a fully automated 4v2800 tertiary solids removal plant, capable of treating up to 132 L/s of flow, to enable the site to meet the new consent of 0.24 mg/l for phosphorus. The project is the largest UK FilterClear installation to date. Barton WwTW, located north of Preston, is a trickling filter works with SAF and NTF stages. It serves a population equivalent of 6,600, expected to rise to 8,700 in the near future. BwB will provide a 3v1840 TSR plant capable of treating up to 44 L/s that once completed will enable United Utilities to meet the new TP consent of 0.5 mg/l. Delivery date is scheduled for July this year with estimated completion in October 2019. 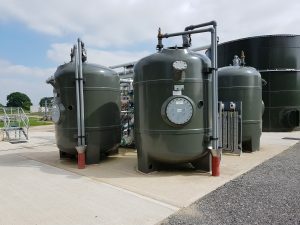 The project at Dyserth WwTW, a trickling filter site in north Wales, is one of five P removal schemes awarded by Welsh Water to assess viable technology solutions to address the tightening of phosphorus consents. These advance projects, prior to their larger P removal programme in AMP7, will give DCWW and their Tier 1 partners valuable delivery and operational experience and guide their decision making progress in AMP7. Once completed, the FilterClear plant will treat up to 29 L/s and enable the Client to meet their new phosphorus consent of 0.37 mg/l. FilterClear is a high-rate multimedia filtration technology, capable of treating flows ranging from 2 L/s to in excess of 1,000 L/s. The technology utilizes the vessel headspace for flocculation, thereby eliminating the need to provide additional upstream flocculation with mechanical mixing stages. Additionally, the relatively low head loss offers operational cost savings against higher head systems.